REVEALS HER PERSONAL JOURNEY TO ITS CREATION. I have long thought business can be a vehicle for social change and I saw luxury perfume as the opportunity to economically empower women hidden at the bottom of the supply chain, through commerce not charity. I have my family to thank for providing a footprint for me to aspire to be a social entrepreneur and planting the seeds of Sana Jardin’s Beyond Sustainability™ Movement. My grandmother, Mary Pomeroy, gifted me with a desire to work towards social justice and empower women economically. Often described as a visionary of her time, she co-founded The United States Delegation for Friendship Among Women in the 1960’s. Her work took her to emerging economies across the globe, with the aim to increase communication between women from the US and developing countries. I grew up in a small Midwestern town in the US, but as a teenager she tucked me in her suitcase and took me around the world. My mother, also an intrepid traveller, business woman and the President of the Delegation, accompanied us and taught me to embrace all cultures and promote women’s rights. I studied for a Bachelors and Masters of Social Work in Chicago, while working as a clinical social worker with low-income children and families. I sensed that the families I worked with could benefit more from access to financial resources and career opportunities more than counselling. As a result, I shifted my focus to implementing innovative economic solutions to social problems on a macro level. I feel honoured to have worked with philanthropic and charitable foundations in New York, the Middle East and London, including The Robin Hood Foundation; as a development adviser for President Clinton’s Health Access Initiative; and serving as a governing trustee for Cherie Blair’s Foundation for Women. 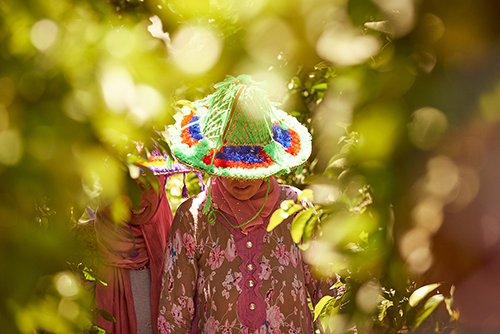 With Sana Jardin, I wanted to use my experience to help the indigenous female flower harvesters of Morocco achieve gender and economic equality and promote cultural tolerance. With a movement that can be scaled to other parts of the world where raw floral materials are harvested, and across multiple businesses to engender sweeping, positive social impact. I am attracted to the wisdom and possibility scent offers. The invitation to journey; a glimpse of the something we were that we forgot; the promise of beauty and sensuality that deeply resonates with me. I was drawn to the pure, natural scents I experienced in the gardens, temples and palaces on my travels around the world. I constantly sought out these earthy, intoxicating scents, and tried to find them everywhere in a bottle – from the souks of Damascus, Marrakech and Oman to department stores in LA and London. When I couldn’t find them in a bottle I resolved to recreate them. In my research for Sana Jardin, I found myself drawn to the stories of the ancient and sacred power of perfume. I was enchanted with the rituals women perform when harvesting flowers, for example the women in Morocco chant as they collect the flowers for Sana Jardin. I wanted to continue in this tradition with fragrances that harness the healing life force of plants and flowers, with the capacity to transport, lift our feminine energy, alter our vibrational aura, and awaken us to our divine spirit. Thank you for choosing Sana Jardin and using your power as a conscious consumer to help empower women. Ce fut un matin comme les autres a l'exception qu'il ai plut la veille, et au reveil nous pu apprecier cette parfaite odeur qu'est la pluie matinale.